These are what I call marketing jibberish. We use words that mean something to you to suggest that this product will somehow make your life better. Drinkability. 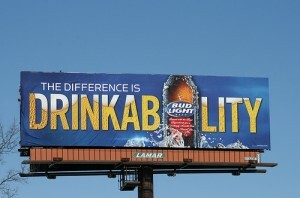 How is Bud Light more drinkable than any other beer or beverage? Think about it. Drinkability. Able to be drunk. 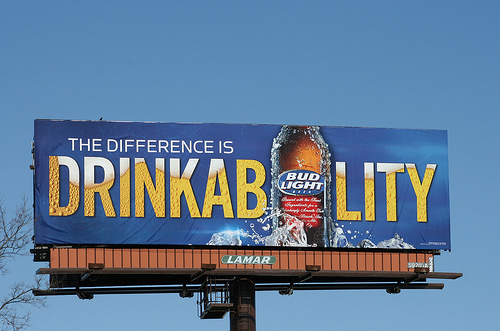 Every drink has drinkability. Of course the suggestion here is that this beer has all then qualities you want in a drink, it’s one you want to drink, others are somehow, NOT drinkable. Authentic. What an overused and maligned word. 1. not false or copied; genuine; real: an authentic antique. 2. having the origin supported by unquestionable evidence; authenticated; verified: an authentic document of the Middle Ages; an authentic work of the old master. How often do you think you drink fake coffee? Do you wonder, when at Starbucks, I sure hope this coffee is authentic? And what is a coffee experience? Do I even want one? I just want a cuppa joe while I experience something else. Something called life. Save money, live better. Is there really a connection? And who can raise their hands that their quality of life is better due to Walmart? Sure, maybe you own more cheap junk, but better? I write this, not to attempt to change marketing, that is a daunting task. If you are interested in that, check out Adbusters and sign up to become a Culture Jammer (don’t breaks any laws tho). I write rather, to just make us think. What are we subconsciously buying into by not questioning the consumption. I don’t mean consumption of the coffee, I mean intellectual consumption. We take in so much crap that the good stuff has a hard time finding purchase in the folds of our gray matter. If we dilute words and meaning, we are diluting Truth. Truth comes to us through word and the Word. If those words lose meaning, truth loses its potency. Let’s be like the Bereans who were praised for searching out a matter. Let’s be those for whom words matter. Let’s not let meaning become subjective and vague. Truth is a sword, let’s wield it with accuracy.